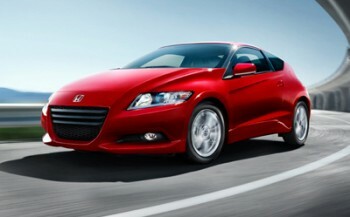 If you’re getting flashbacks and are looking for a used Honda CR-Z to replace your old Honda CRX, we don’t blame you. We get drivers from Mechanicstown, Middletown, and all over the state looking at the CR-Z as a modern, hybrid take on Honda’s famous model. At our Mechanicstown-area used Honda dealer, we think that the CR-Z is an impressive car in its own right, combining sports car features with a hybrid powertrain, but its similarities to the CRX make us smile too. If you’re looking to get into a CR-Z, finding a used one might be a bit tough, but we want to help. Here is a quick profile of what you can expect out of a used CR-Z. The hybrid powertrain comes with your choice of manual or continuously variable transmission (with paddle shifters), so you can choose which transmission gives you more control. Choosing the CVT boosted the fuel economy of the 2013 CR-Z to 39 highway mpg from the 38 highway mpg of the manual transmission model. While the CR-Z is pretty new, we are getting more and more used models, and if you’re looking to save on an incredibly stylish and fuel efficient car, you’ll have a hard time beating a used CR-Z. Contact our sales experts to let them know you’re on the lookout. You’ll find Middletown Honda not far from Mechanicstown at 520 Route 211 East in Middletown, New York.